Red Rocks put your hands together for an unforgettable experience as one of the best bands on the live music scene returns for two whole nights of music! Tedeschi Trucks Band are globally known for their flawless concerts and true musicianship as they come to wow each and every crowd they comes to perform to. Red Rocks Amphitheater is proud to celebrate another incredible summer with only the very best musicians and artists – don't miss out on Tedeschi Trucks Band LIVE on Saturday 27th July 2019! Tickets available NOW. 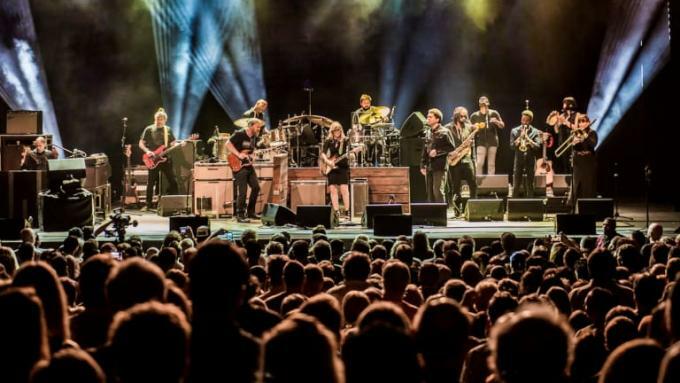 Tedeschi Trucks Band are returning to Red Rocks for another mind blowing night of solid entertainment, the incredible group are best known for their performances as they bring an exciting energy where-ever they go. With the soulful guitar licks for Dave Trucks and the passionate vocals from Susan Tedeschi – together their sound is complete! Since 2010, the two of them have been taking to the stage to showcase their talents and haven't looked back ever since… their successful tours and shows have enabled them to perform with some of the greatest names on the music scene and they just keep on giving! With a total of four studio records and four live albums, Tedeschi Trucks Band have released some impeccable music to the world such as their debut album, Revelator in 2011, which grabbed them the 2012 Grammy Award for Best Blues Album. And was given such high praise and positive feedback all around from music critics and their ever-growing fan base a like. "Proves something beyond their well-founded reputation as a live unit: that they can write, perform, and produce great songs that capture the authentic, emotional fire and original arrangements that so many modern blues and roots recordings lack… Revelator is a roots record that sets a modern standard even as it draws its inspiration from the past. It's got everything a listener could want: grit, groove, raw, spiritual emotion, and expert-level musical truth." Get yourself prepared for the best show in blues rock this coming summer season as Tedeschi Trucks Band capture the audience in their outstanding performance, this duo and their band sure know how to showcase themselves to the full and share their love for music with the world. This is a band that truly pours their heart and soul into everything they do!